The current Synapse forecast presents Low, Mid, and High cases for a national CO2 price extending out to 2050. Our analysis results provide a range of data-supported prices that can be reasonably expected throughout that timeframe. Our newest report, Spring 2016 National Carbon Dioxide Price Forecast, contains analysis updated with the U.S. Environmental Protection Agency’s (EPA) recently finalized power plant emissions regulations, in addition to other relevant regulations and recent rulings. This analysis assumes a zero price though 2021, at which point we expect compliance with EPA’s Clean Power Plan to begin to put pressure on CO2-emitting power plants. The forecasts here assume trading amongst relatively large groups of states. In the Mid and High case, Clean Power Plan compliance is followed by policies that achieve more stringent levels of emissions reductions, consistent with climate-based goals. 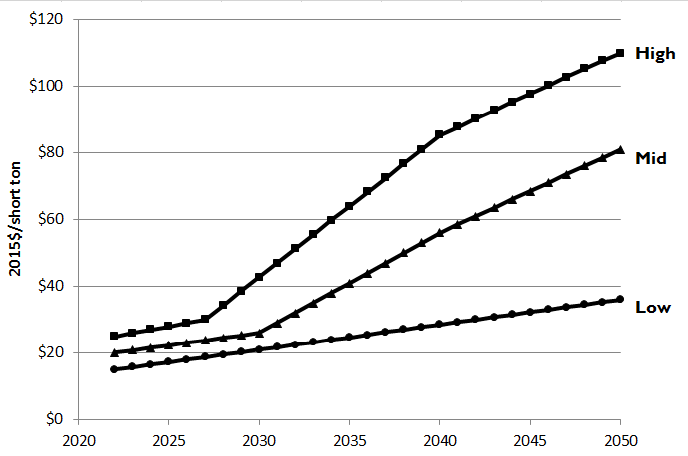 The table below shows the Synapse CO2 price forecasts for the three cases for the near-, mid-, and long-term horizons. Read the full report. Note: Prices expressed as 2015 dollars per short ton.